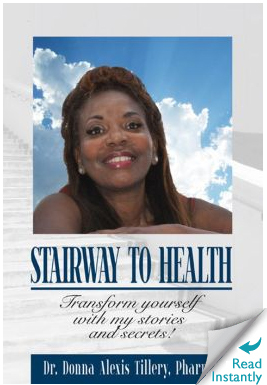 My new ebook, “Stairway to Health” is now available on all the major booksellers sites. As a baby boomer, pharmaceutical scientist, researcher, and lecturer, my goal is to help you keep your body alive with various rejuvenating techniques. This dynamic book encourages you to constantly renew your youth through self-preservation. This book will help you change the chemicals in yourself. The goal is for you to learn how to change your body dynamically with an emphasis on the face and abdomen. This book focuses on my diet, simple delightful recipes, and exercise, especially twisting, along with the use of leg weights, and some cardiovascular work; physiological changes, and psychological well-being: staying positive in thought, activity, meditation, and association. I will advise you about foods and supplements rich in serotonin that deliver feelings of well-being and keep you energetic. This book also contains an introduction to simple exercise and skincare. It is no secret that the body undergoes an immeasurable amount of changes from birth to old age. Just look at a newborn baby and an old person. What a difference! It’s like night and day. Sadly enough for some of us, aging occurs more quickly than average. However, we are responsible for our own health and happiness, which requires consistent work for us to be vibrant and beautiful. There is no need for expensive life-threatening surgeries, painful devastating fasting, or drugs. Anybody can use this diet. The new lifestyle I recommend is designed to get you in shape and slow down the aging process. It features an all natural and purely organic diet. With this heightened knowledge, you will have MORE control over your life!